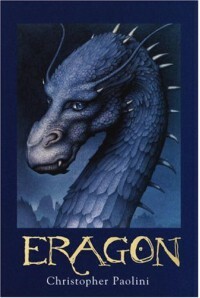 I’m going to echo a bunch of other reviewers and say that Eragon is okay, but I liked it better when it was Star Wars. There are a plethora of reviews and wikis out there that painstakingly lay out the similarities between Eragon and Star Wars, Lord of the Rings, and David Eddings’s The Belgariad (OMG, the silver mark on the palm. How did I not notice that the first time I read this? How?! ), so I’m not going to exhaust myself by reiterating oft-repeated points (some of which I covered in my progress updates, which I’ll link below). Basically, Eragon is Star Wars in LotR cosplay at a Belgariad-themed LARP event. To say this book is derivative would be putting it mildly. And you can argue that Star Wars is derivative in its own right, but it’s not lift-an-entire-scene-including-dialogue-from-another-source derivative. This isn’t a standard take on the classic Hero’s Journey. This is a clumsily constructed Frankenstein’s Monster of several existing heroes’ journeys by someone who may or may not have read any Joseph Campbell and just thought Star Wars would’ve been cooler with dragons. And who can blame him? I mean, dragons are awesome. There is something to be said for derivative novels. If nothing else, they’re easily accessible to a wide audience and can act as a gateway to better, more original stories. So if this book got any kids into reading fantasy, then it’s got at least one redeeming feature. But I can’t help feeling that this is a mediocre work of fiction made exceptional (and I use the term loosely) only by the age of the author. It’s a pity about that movie adaptation, though. Yikes, that was awful.